Dash cameras are one of the fastest growing gadgets. Drivers are realizing that dash cameras protect them from accident liability. In addition, businesses are realizing that dash cameras are the next big trend for fleet safety. Accordingly, let’s determine the best camera solutions by navigating through the top 10 dash camera features. In no particular order, here are our top 10 dash camera features! Camera quality is one of the most important features. Dash cameras have a huge cost range, all with different quality levels. Some are $100. Others are well over $1000. It all comes down to if the cameras will work. Nothing is worse than having a broken camera when footage is needed! Accordingly, it’s important to consider the camera’s reviews, manufacturer, and warranty. The best cameras should have no red flags. Live streaming is important for businesses. Businesses use live streaming to check if drivers are following rules or to train drivers in real time. For instance, one manager used live stream to check if drivers were wearing their uniform. Video quality should be clear for reviews. HD video quality is a must because lower quality cameras might not be able to catch things like license plates. Let’s say a driver gets in an accident and needs to review footage. What happens next? A lot of cameras require the driver to take out the SD card and review footage on the computer. They would then need to find the exact moment where the accident happened. Incident-based recording is a much more efficient process. 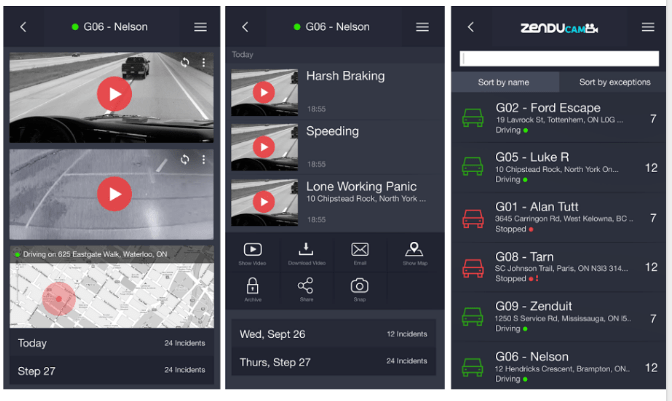 Dash cameras with this feature detect accidents and filters the footage. As a result, users do not need to review hours of useless footage. Businesses love GPS integration. GPS devices measure things like driver location and driving habits. A recent trend is to connect that data to video footage. For example, let’s say a manager needs footage of when drivers are at a specific site. This can be done with an integrated system! The manager would first enter that location into the system. From here, the GPS detects when drivers arrive at the location and then tells the camera to record and save footage. The last two features let drivers and managers save footages. What if drivers need to save footage? Some dash cameras have a panic button. When a driver presses the button, the camera saves footage for before and after that time. A common concern is the camera’s storage space. Many cameras have limited space because they only rely on SD cards. SD cards need to be wiped when it’s full in order to record new footage. Cloud storage is another way to store data. This feature is handy if a user wants unlimited storage. In this process, important footages from crashes, GPS rules or panic buttons are saved online. People are then able to dig up saved footage from many, many years ago! A related concern to cloud storage is how the footage gets online. This is usually done by one of the following two ways. The first way is a manual upload. Owners need to eject the SD card, plug it into a computer and then save it online. Alternatively, the second way is through wireless uploads. Wireless uploads are much easier than manual uploads. Cameras with this feature can upload videos to wifi. It is also important for large companies, where drivers can remotely upload footage instead of traveling to headquarters. Tamper-free cameras are another important business feature. 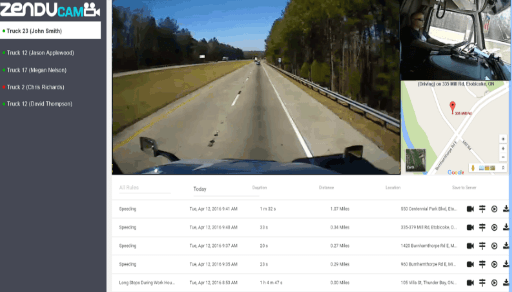 A recent problem is that some company drivers tamper with camera footage. In one company, a driver got in an at-fault accident. The driver ejected and destroyed the SD card. In order to prevent tampering, some cameras are tamper-free. For example, certain cameras lock the SD card slot with a key. The key, which would be kept by the manager, is required to eject the card. Is it enough to have dash cameras? Some people say no because they need multiple cameras. Some dash cameras allow owners to add side and back cameras. As a result of setting up multiple cameras, incidents can be recreated from every single angle. Did you enjoy our top 10 dash camera features list? 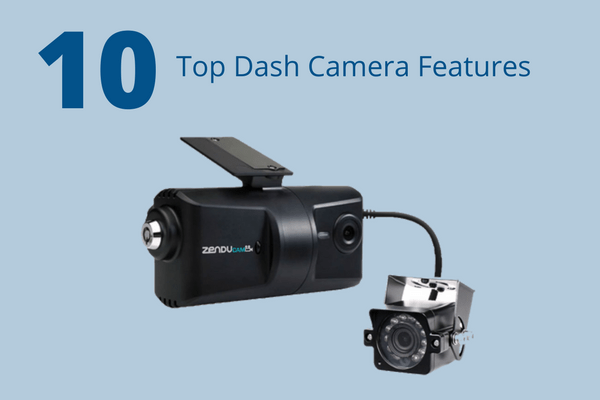 Take a look a ZenduCam, which includes all of the top 10 dash camera features!